If convenience is important to you, as well as quiet and relaxation, this is the perfect location for you. 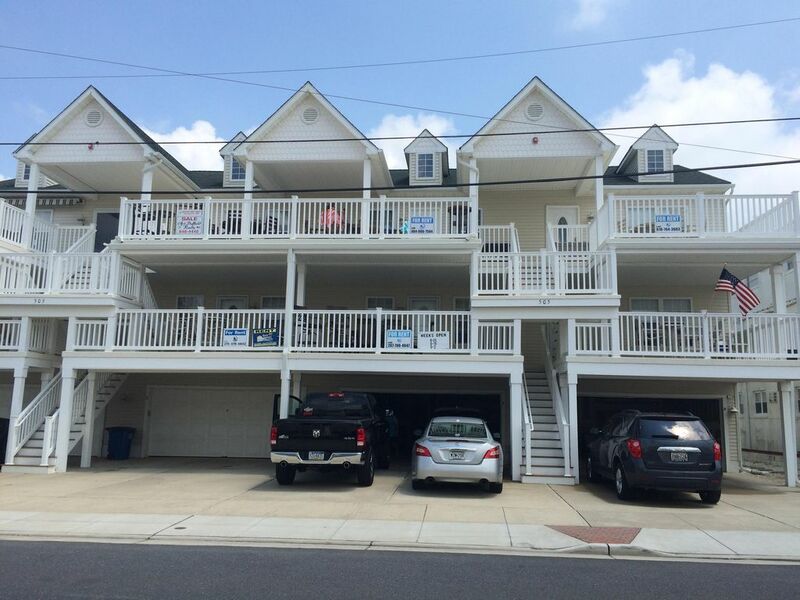 Located at 13th Street and JFK Boulevard North Wildwood. Enjoy this Non-Smoking, first floor condo offering a deck with oceanviews of the beautiful Atlantic Ocean, and just a few steps to the beach and boardwalk. Get away from all the hustle and bustle of your daily routine at home, and relax on the beautiful lifeguard protected beach. For your safety, the lifeguard station is located just two short blocks over. Just pull up your chair, and catch some rays, play in the sand, or ride the waves. You will be staying only two houses away from the beach and the boardwalk. You can leave your car behind, and enjoy all that Wildwood has to offer. Within walking distance the boardwalk, with rides, water parks, games, shops, restaurants, and more. It has something for everyone of all ages. Historic Cape May, Cape May County Zoo, Cape May Bird Sanctuary, Cape May-Lewes Delaware Ferry, Wetlands Institute, and Wildwood Convention Center are all just a short drive away. When you return, there's off street parking with a one car garage, and one additional parking spot. This modern, three bedroom condo offers sleeping for eight. The master bedroom with a queen-size bed, and a full bathroom. Two additional bedroom, with one full, and two twin-size beds. The large open living room/eat-in kitchen has a queen-size sleeper sofa. Also included is an outside shower to rinse off after the beach. All kitchen amenities are included such as dishware, cookware, glassware, and flatware. ADDRESS; 505 E. 13th st.***** 2nd HOUSE from the BEACH !!!! Next to Trylon motel which is beach front at 13th and JFK blvd. Just cross 13th street to the start of the 2 block ground level boardwalk and then up the main ramp of the boards at the North end. My husband and I chose this property because of it's unique location. It is just off the beach and boardwalk so it is quiet but extremely close to everything. The beach is a great size not too small like streets closer to Angle Sea and not too big. It is a very short walk from the condo to the ocean ! As well as a very short walk to the Boardwalk. There's few times we use our car because you can easily walk or ride a bike everywhere ! We love the location ! Large oversized covered deck for shade with a large table with six chairs. Also additional 2 bar height chairs. 3 Cable TV's, Toaster, Toaster oven, Coffeemaker, Refrigerator with ice maker, iron and ironing board, NO PETS, NO SMOKING, NOW BOOKING RENTALS FOR 2018 !! Located across the street from the 13th ave beach. 15th ave Playground, North Wildwood first aide station, with bathrooms and handicap access.